Check that no one else has claimed your page in the checklist and comments below. Comment below with the name of the page you would like to translate. Take only one page at a time. Clone this repo, translate your page, and submit a pull request! Before contributing, read the glossary to understand how to translate various technical and React-specific terms. Please be prompt with your translations! If you find find that you can't commit any more, let the maintainers know so they can assign the page to someone else. When PRs are merged, make sure to mark that page as completed! To do before releasing as an "official" translation. Please translate these pages first. the corresponding sections are translated to do these. Everyone is hooked on hooks! People are really excited for these and it would be great for them to be translated. These are the pages that you get when you click the links in the console (e.g. https://reactjs.org/warnings/dont-call-proptypes.html). People tend to search these, so please don't translate the error message itself. Components in src/components that have some text in them. These are not the primary translation targets. Hey, I'd like to help. I'll take the Hello World page on the basics section. Ok? @rafael-vitor @ericp3reira @httpiago I gave you the sections you requested! @mathsalmi could you pick another section? @cezaraugusto @jcserracampos @WendellAdriel make sure you follow this issue and update it when people volunteer! I would like to work on "Introducing Hooks"
I would like the Components and Props section. Hello! I'd like to translate Thinking in React. I can not translate the whole page, there are some parts with red text that I can not edit, so I'll go to another page: Handling Events. @httpiago what do you mean "red text I can't edit"? Please only request a page at a time. I gave you "Handling Events" for now. @httpiago Ah, we're not editing the text directly in Crowdin -- it's just a reference to make your work easier. You should do your translations directly in the source code! Either directly edit the file here by clicking the pencil icon or clone this repository and work on it on your preferred text editor. @tesseralis ok if I split this issue into each part with its own issue? my plan is to have an issue covering in checkboxes each page heading for example. this could speed up the process as it is less text to translate and so less effort from maintainers to review. from past experience, anything bigger than 2 paragraphs can take months to finish due to work/life/motivation loss and this plan tries to avoid a page being stuck with someone longer than it could be while others could contribute. I will explain about it right now in portuguese to everyone. "Pessoal, todos aqui devem fazer um fork desse repositório e após isso, criar uma PR de acordo com a lista criada pela @tesseralis e assignar o seu nome ao lado da contribuição que realizará, juntamente com o número da PR. Quando a @tesseralis mencionou o Crowdin, foi com a intenção de vocês darem uma olhada como foi feita a tradução anterior. As novas serão realizadas via Git ;)"
@cezaraugusto o que acha de criarmos uma outra Issue para discutir as traduções em pt? ou mantem essa aqui mesmo? Ahh... I think I'd rather have it stay in one page, just so we can get an overall goal on the translation progress (and I'm also trying to get a progress tracker going that relies on having a whole issue for the translation). We don't need to translate the entire thing before releasing the first version -- just the pages labelled "Core Pages". I don't think people have gotten dissuaded so far: it's been a week and both the Japanese and Spanish translations are almost done with the Core Pages! I think splitting might make some things easier but it can make other things harder too. It's harder to make sure that people aren't taking more than one issue, for example. Let's keep the one page for now and if you're finding it too cumbersome in a few days, I'll reconsider! @tesseralis I can translate Home Page and Tutorial. I would like to translate Composition vs Inheritance and Thinking in React for now. We'll have both pt-BR and pt-PT, or just pt-BR? @telmogoncalves this repository is only for the pt-BR translation, but if you want to, you can submit a PR on https://github.com/reactjs/reactjs.org-translation/ to create a team and a repo for the pt-PT. So @welll could you assign me to translate this page #136 on task list, please. @welll just to confirm, I should translate the #136 or Blog - (React v16.8: The One With Hooks)? Yes, I've been confused, but now I'll start the translation of React v16.8: The One With Hooks. Hi everyone, I've done the translation for Versioning Policy, it was assigned for @juunegreiros, but we've spoken and she allowed me to do it! Please review the PR and let me know is there's anything to be adjusted. Thanks! I can translate Community / Support ? @Duduzera1997 @WeslleyNasRocha será que conseguimos finalizar essa tradução até amanhã (domingo 10/03)? Não entendam como uma cobrança! Congrats on finishing the core pages! 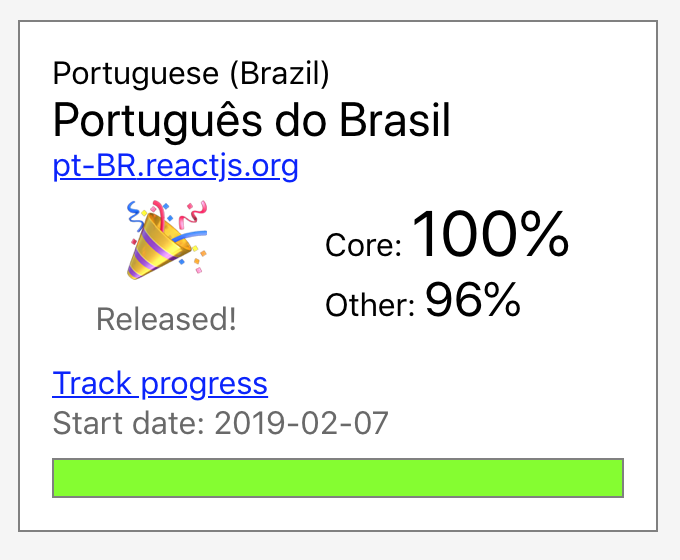 Alterado de "Rect" pra "React" na linha 23. I just merge the last translated page, can we mark the issue as done? @jhonmike yup, I think so... we already have an issue to track translating the blog, and maybe we can make another one for tracking the translation of the Community section? it will be awesome if we do that. Pessoal! A tradução da documentação do Reactjs.org já está 100% completa. Antes de mais nada, gostaria de agradecer a todos aqui pela ajuda prestada! Foi lindo tudo o que aconteceu aqui! Vocês e nós da Comunidade Técnica - são demais! Parabéns a todos! E muito obrigada! Pessoal, primeiramente eu gostaria de parabenizar pela iniciativa que tiveram, eh muito interessante para pessoas q n tem o domínio do inglês e querem aprender uma ferramenta nova, mas a doc da mesma só tem em imgles. Novamente parabéns a vocês. Aproveitando gostaria de perguntar se vocês irão extender para a doc do react native, caso sim, como faço pra contribuir? I'd like to translate the 2017-11-28-react-v16.2.0-fragment-support.md.